and stamped all over a piece of the brown shipping paper I had left over from making the kids’ human body diagrams. To take the simplicity one step further, you could totally do this with a paper grocery bag if your gift is small enough. 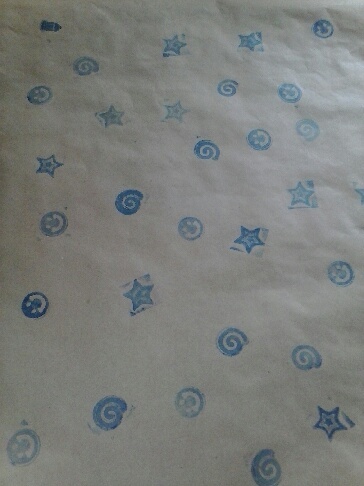 Then, once you have your stamps and ink, you could always have free wrapping paper (just buy a few groceries first ;)). Score! 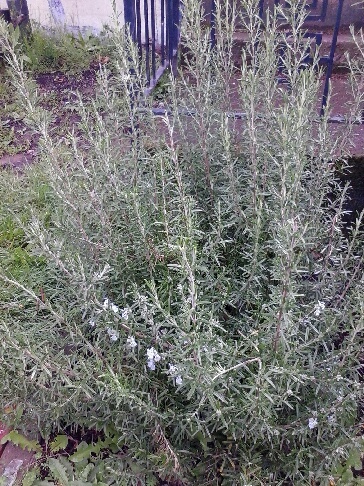 One of my very favorite things about our new house is the rosemary bush in the front yard. My sister-in-law planted it when she and my brother lived here (her father is our landlord), and I can’t thank her enough! Not only is it pretty, but it’s very practical. Whenever I’m making an Italian sauce, I just send the kids out to clip a sprig. It’s fabulous. And fresh rosemary doesn’t take nearly as long to cook in a sauce as dried rosemary does, so that’s another big benefit. I hate hard rosemary in my spaghetti sauce. What’s your favorite herb? To be perfectly honest, rosemary isn’t mine; thyme is. But I don’t have a thyme plant in my yard ;). 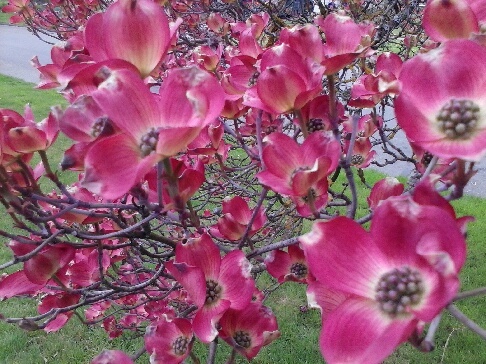 We were out walking the other day, after picking up the kids from “Club Mud” (the pottery class they go to every Tuesday – more on that in a future post), and I just couldn’t resist taking a picture of this dogwood tree. I thought it was absolutely stunning in full bloom. Hello everyone! Today I have something that may or may not apply to you, but it’s what I’ve got :). 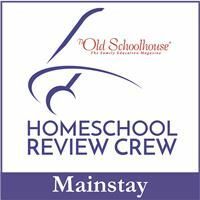 About five months ago, when we moved out of the apartment and into the house, I started reading more blogs, and with the information I’ve gleaned from sites like this, this, and this, I decided to really embrace my housewife/stay-at-home-mom status. 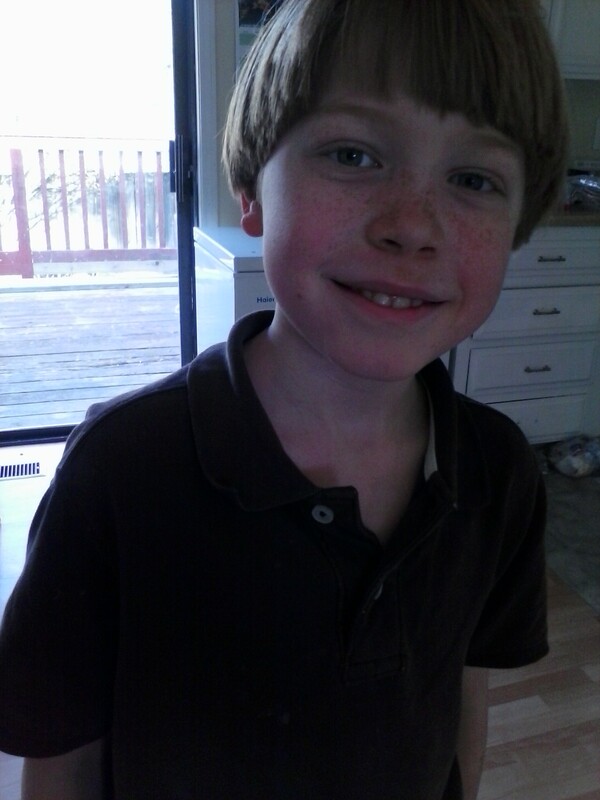 Seahawk is 9 now, and I’ve spent most of his life as a non-working mom. The difference between that and a stay at home mom is the amount of time spent on the house and kids. I’m sorry to say that I was quite selfish for a while, especially during my 2-year writing stint. It doesn’t do any good to dwell on the past, so I’m not going to. Instead, I’m going to look to the future and continue to be the wife and mom God intends me to be. What does that mean for today’s post? I’m glad you asked :). Part of being a better mom (to me) means providing a healthier existence for my family, from homemade laundry soap (to avoid chemicals) and cloth diapers (to save the family money, as well as being environmentally friendly), to homemade baby food for Small Fry. The latter is what I’m going to talk about today (duh). 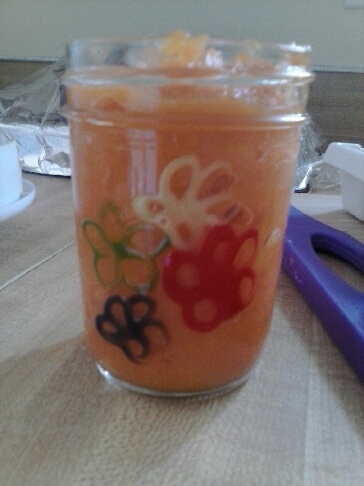 It’s really easy to make baby food, and less expensive than the jars or plastic tubs. Not to mention, there’s virtually no garbage associated with it. That last item alone is worth it to me. Well, that and the fact that I can use organic fruits and vegetables and control the ingredients used. 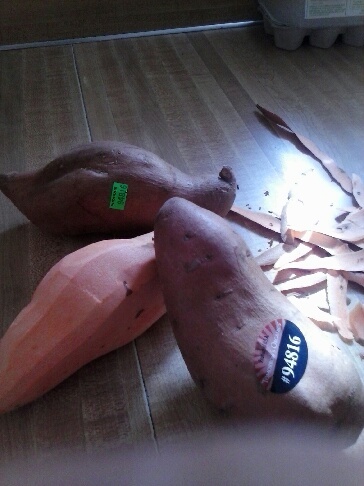 I made this on Monday and was using organic sweet potatoes (or yams, I’m not sure; I don’t like either, so I don’t usually buy them). 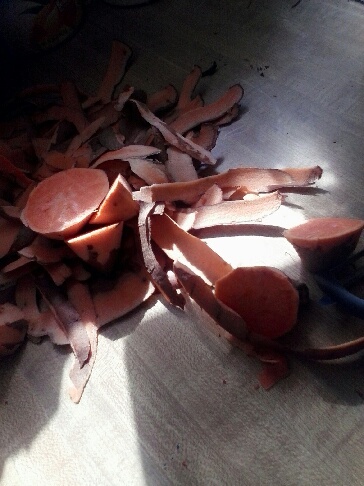 After peeling them, I was left with a nice pile for our compost :). 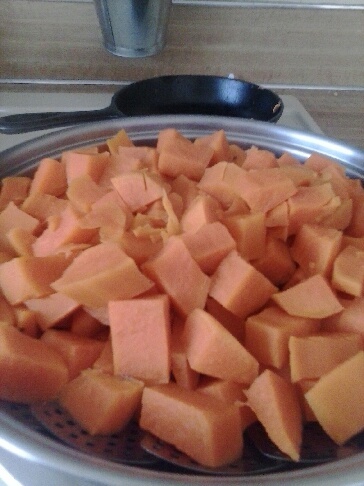 Next, cut it into smallish chunks and place in your steamer basket. Add enough water that it won’t all boil off and burn during the cooking process – I speak from experience on this! 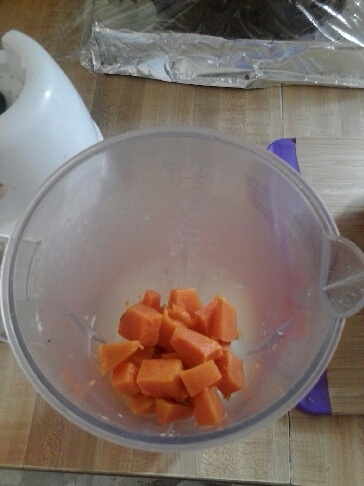 In stages, so as not to overwhelm your blender (unless yours is better than mine and can handle it), puree the chunks until they’re the consistency you want. If you need to add liquid, use what’s left from your steamer; that way, you’re adding any nutrients that were lost in the cooking process back in. One word of advice, though: make the baby food thicker than you think you’ll need. You can always thin it out by adding breast milk, formula, or water when you feed it to your baby. By leaving it thicker, you’re prepared in case your baby advances to ‘heavier’ foods while this is frozen. 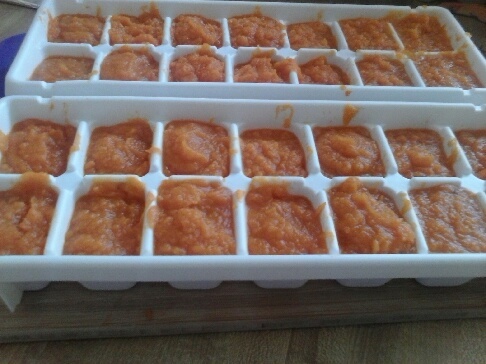 When it’s all pureed, put it into ice cube trays and freeze. 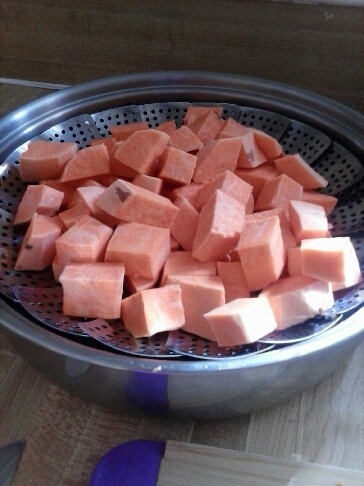 My three potatoes made more than enough to fill the two trays I have designated for baby food, so I just put the leftovers into Small Fry’s normal feeding jar and didn’t have to worry about thawing food for two days. That’s it! Well, actually, there is one more step, but I forgot to take a picture, and that is to move the cubes to a ziploc freezer bag once they’re frozen. Thaw the food as needed for feeding your baby. A really young baby will probably only need one cube per feeding; Small Fry will be 9 months tomorrow and he’s up to 2, sometimes 3. This was Monday, and I’ve been looking forward to today’s post all week so I could share this with you guys! Seahawk isn’t really sleeping, but Small Fry is. 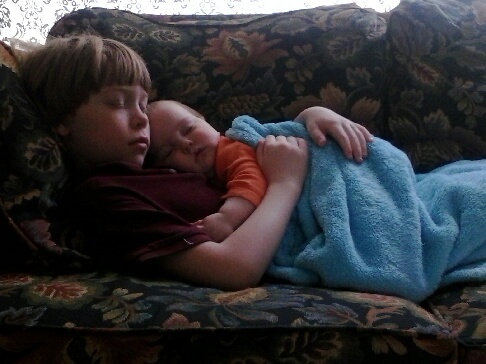 Using the song from Wednesday’s post, Seahawk cuddled his baby brother to sleep. He was so proud of himself! 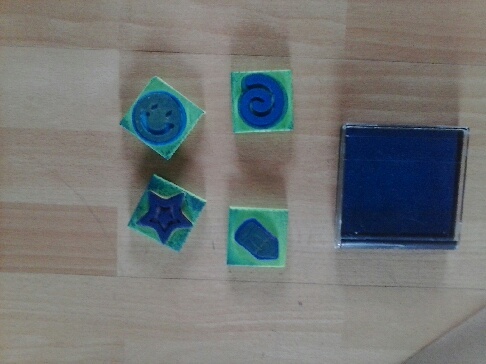 Here’s what the kids got when we were there last week. 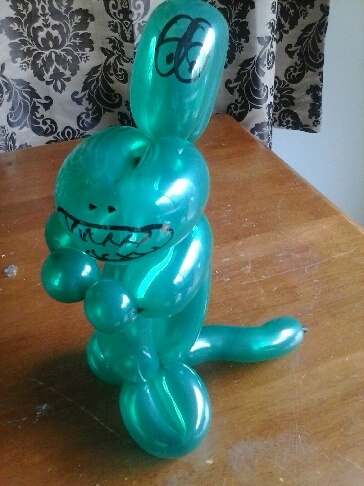 Seahawk chose a dinosaur. The kids’ favorite part of this was that the guy “kept a Sharpie in his pocket for drawing on them!” with. A secret about me: I could never do these. I’m always too afraid the balloon will pop. 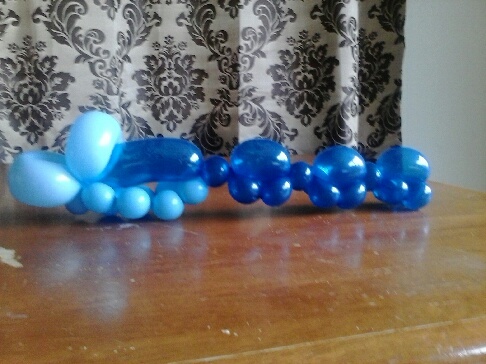 Knowing that the balloons are designed to be twisted and manipulated this way provides me no comfort! Every baby is different. There’s no doubt about that. Small Fry is not the same as either of his brothers were. Or maybe it’s just that hubby and I are different people since he’s a bit of a gap baby. Who knows? In general, he’s a pretty happy baby, but like all of us, he has his moments – usually when he’s not had a good nap. There are times during those tantrums (for lack of a better word) that I’m not available to comfort him. Since I’m still his favorite person, this can pose a problem for the rest of the family. So we’ve found something that’s almost as good as me: this song. 9 times out of 10, this will calm him down. It’s not strictly limited to this particular song; anything Leigh Nash sings has a calming effect on him. I think he has a baby crush on her ;). But this one definitely seems to be his favorite. 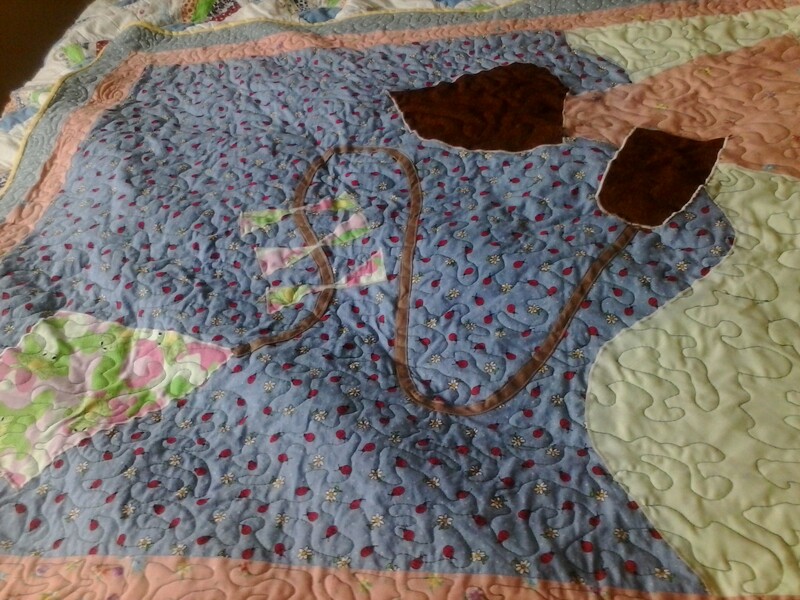 Okay, just two quilts, actually. This quilt was my first time using a free-form quilting style, and I must say: I loved it! Because there was no overlapping stitches, it was much easier to keep the fabric from bunching. I definitely see myself using this style again. 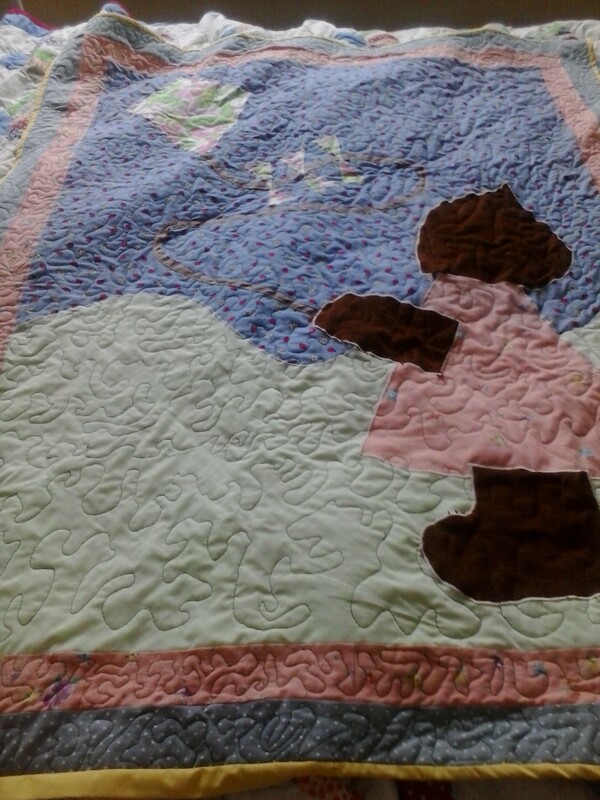 The second quilt I want to talk about today is my first attempt at a rag quilt. This one was made using some of Small Fry’s outgrown baby clothes. 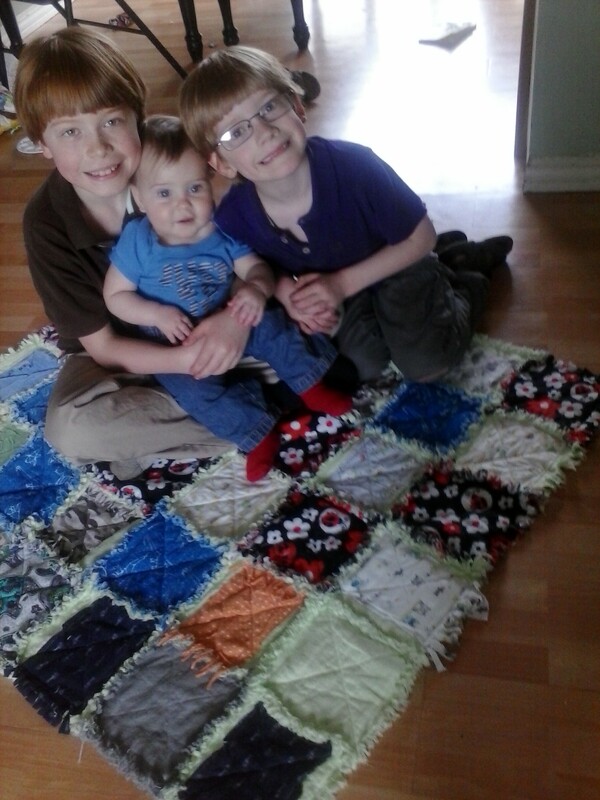 I seem to have forgotten to take a picture of the quilt by itself, but you can still see it in this picture. My favorite block is underneath Seahawk’s foot, and it’s an emblem from one of Small Fry’s newborn shirts that says “Little Brother” baseball-jersey style. I put it in the center so it would have a place of prominence. My second favorite is the one right next to Seahawk’s knee. It’s a pair of Small Fry’s pants that he wore for months. It was really sad when I finally had to admit that they didn’t fit him anymore! They’re camouflage and oh-so-cute. 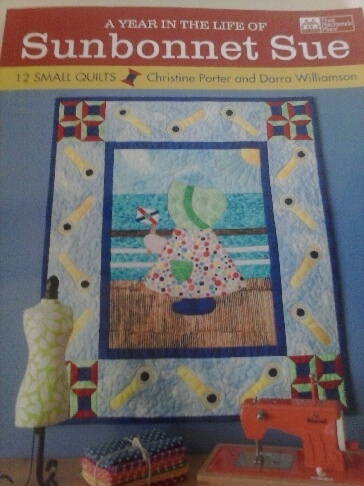 I just got this book from JoAnn a few days ago, and I seriously can’t wait to make these blocks! There are 12, one representing each month of the year. 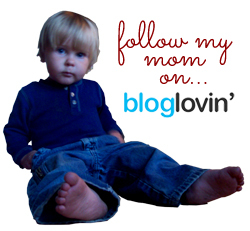 I’ll definitely blog about them when I get started. When I saw this idea, I knew it was the art project for us. 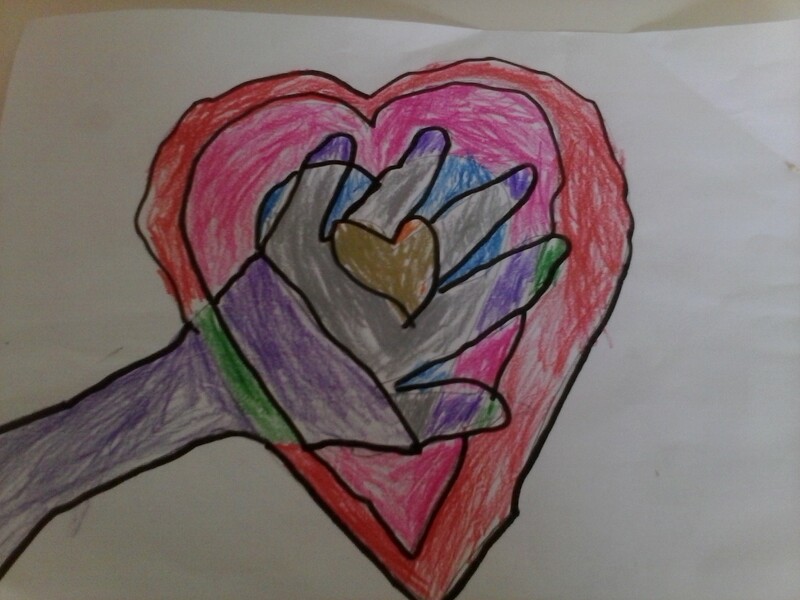 Easy, creative, and used only supplies we already had on hand (namely plain paper and colored pencils). 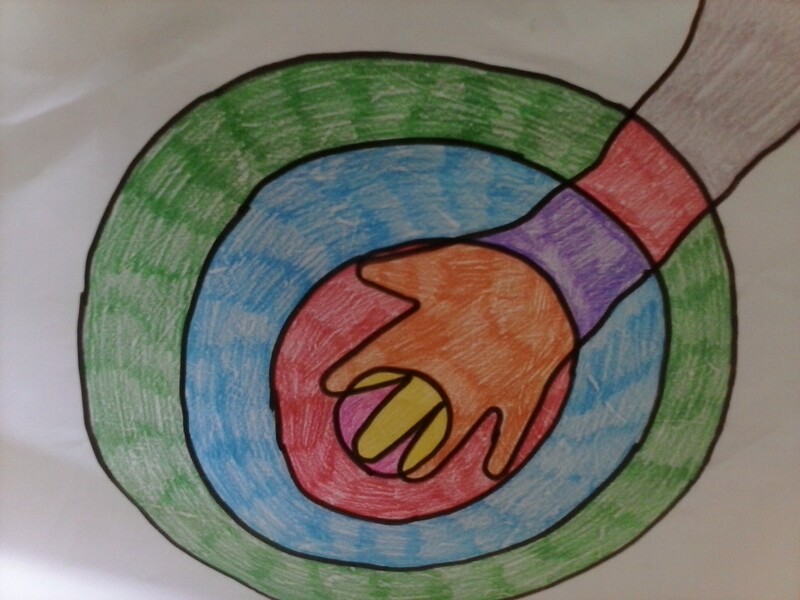 While the original used only circles for the concentric shapes, I let the kids use any shape they wanted. If you think it’s easy outlining an 8-month-old’s hands, think again, lol. But it wasn’t the hardest thing in the world, either. 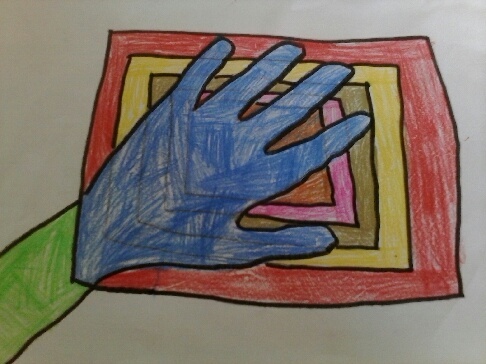 The black outlines is one way we deviated from the original post on this art project, but I found ours were too muddy to tell what they were without them. So if you try this with your kids, feel free to leave them off if you want :). My hubby bought me a new phone this week (! ), and I was just messing around with Seahawk, but this picture turned out pretty good, so I decided to share it with you. He hates his freckles, but I think they’re charming :).